How do you picture yourself on a perfect island escape from the urban daily grind? It would have been marvelous, donning your new bikini or board shorts, lying down on the white sand facing a stunning azure beach view, while deciding what to have for lunch or what type of tea to have in the afternoon? Oops, that would have been my thoughts...I guess, wherever I go, food is always on mind, though there’s nothing more beautiful than the way the ocean refuses to stop kissing the shoreline, no matter how many times it’s sent away, there are far more ways to enjoy life on the beach, most especially at Bluewater Sumilon Island. Aside from wading in the crystal clear waters of Sumilon Island and running after the golden hours to get shots of the sunrise and sunset, I and some of my new found media friends have feasted on all the felicitous offerings of The Pavilion. 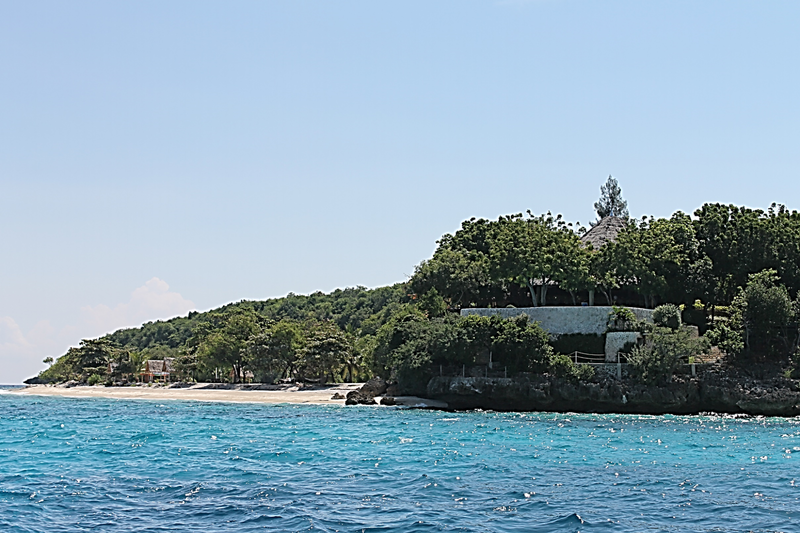 I must say that after visiting Bohol last October, it is moving to become the must-go destination in the Philippines. With this being said, Bohol is said to launch new and exciting tourist destinations with rock bottom prices for airfares, hotels and resorts during a travel fair to be held in Glorietta Mall on Dec. 8-10. To see what's in store for you when you intend to plan a Bohol tour, you might want to check my blog about my recent tour at my father's beloved hometown. Below is the link. Bohol provincial governor Edgar Chatto said the province will also formally launch its new branding “Behold...BOHOL,” which positions the province as a destination that exudes a sense of awe in every visitor. The three-day event is the first time ever that tourism sector in Bohol comes together in a massive campaign to entice tourists to visit. It is part of the Bohol Tourism Action Plan developed through the collaboration of the United States Agency for International Development through its Advancing Philippine Competitiveness Project (USAID-COMPETE), the Department of Tourism (DOT), the United Nations-World Tourism Organization (UN-WTO), and the Pacific Asia Travel Association (PATA) as well as local tourism stakeholders. 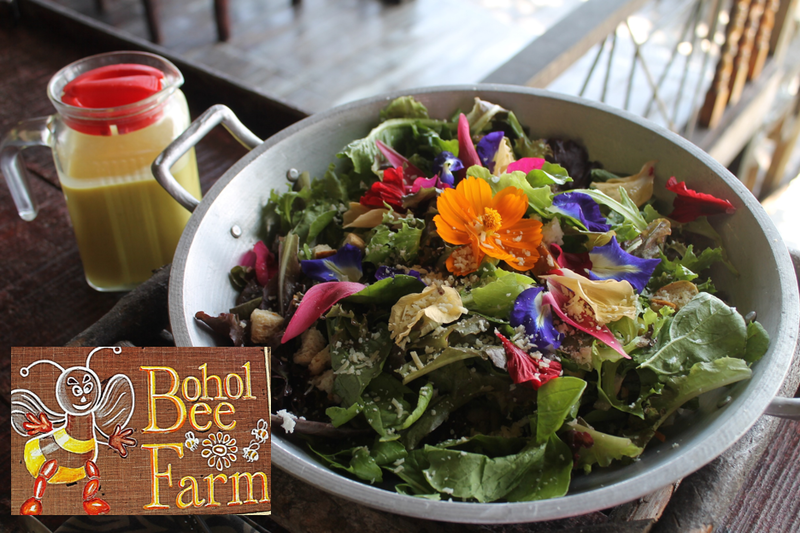 Meanwhile, the new branding “Behold...BOHOL” was developed with the help of CNN’s branding expert Anita Mendiratta. Bohol is the first province that benefited from an outreach program of CNN. AirAsia, the leading budget airline in the Asian region, is the exclusive airline partner for the campaign and will offer seat sale. The airline that has been awarded the Skytrax’s World’s Best Low Cost Carrier for six consecutive years is also committed to offer year-round low fares for flights between Manila - Tagbilaran (Bohol) and Manila – Cebu. At least 50% discount in accommodation, tours and other travel essentials in Bohol will be offered during the three-day travel fair. Boholano products will likewise be on sale. The travel fair will open in a grand program featuring the world-famous Loboc Children’s Choir. The chorale group will have a nightly concert during the three-day event. Bohol province is dubbed as the eco-cultural tourism capital with its fascinating Chocolate Hills, pristine and white sand beaches in Panglao and Anda. It is also home to the well-loved Tarsier, considered the smallest and oldest primate in the world. “We want to develop Bohol as the tourism superpower and a top holiday destination in the Philippines,” said Bohol governor Edgar Chatto. He said the launch of the 'Behold... BOHOL' aims to promote the province as a complete tourist destination because every town has a unique tourist attraction to offer to visitors. Aside from the iconic destinations, the province is surrounded by caves, tranquil rivers, fascinating water falls, marine sanctuaries, mangroves and diving sites. Chatto said Bohol is now promoting the powdery white sand beaches of Anda, as the next tourist destination. Road and infrastructure access to Anda are underway through the convergence program of Department of Tourism and the Department of Public Works and Highways (DPWH) that seeks to connect airports to tourist destinations. Anda is a must visit in Bohol for its unique and wider coastlines making it a perfect destination both for relaxing walk on the beach or water sports activities. 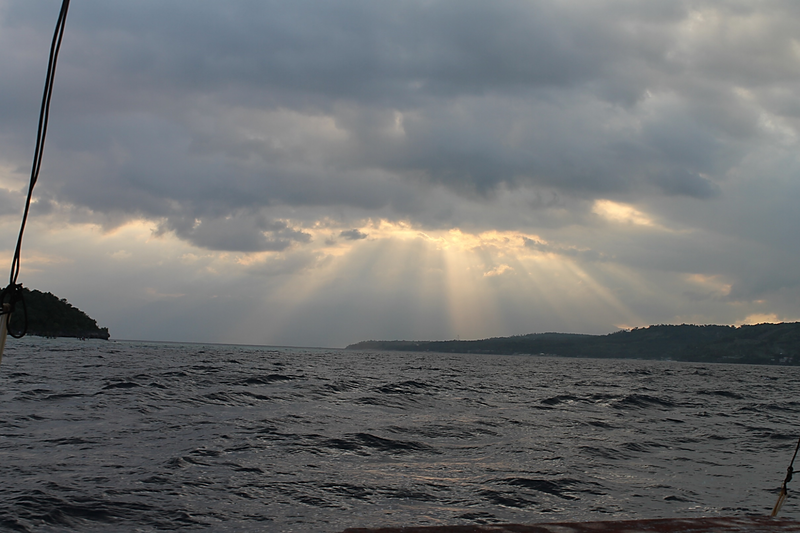 The town is also home to the Lamanok Mystical Island and is fast becoming a popular destinations. Lamanok can be reached within a two-hour drive from the capital, Tagbilaran. The island has a rich lush mangrove protecting the community from flooding, pollution and water surge. It hosts some mystical caves where ancient Boholanons bury their loved ones in jars. Governor Chatto said Bohol is also home to Asia's largest mangrove forest called Banacon located north of the municipality of Getafe. It has a total of 425 hectares with only 15 hectares dry land and the rest are extensive mangrove plantation. In a press statement, the Governor credited the strong support and cooperation of tourism stakeholders in Bohol in promoting the new tourist destinations of the province. “The strong partnership between the local government and the private tourism stakeholders, a well equipped manpower with innate hospitality as well as the rich natural, cultural and historical attractions of Bohol are the three main factors why we are confident to become a tourism superpower,” said Chatto. AirAsia, the Filipino Low Cost Carrier is fully supporting the ‘Behold...BOHOL’ campaign by offering its lowest possible rates for tourists visiting Bohol. AirAsia, the world’s best low cost airline flies three times daily to Bohol. Popcorn eating has gotten a new light in our home. I never knew eating popcorn at home can be as enjoyable as eating popcorn at the movies. Let's face it, when we go to the movies, there's nothing more appealing than the scent of butter and freshly popped corn kernels, that's why every movie theaters had not been totally saturated by it. 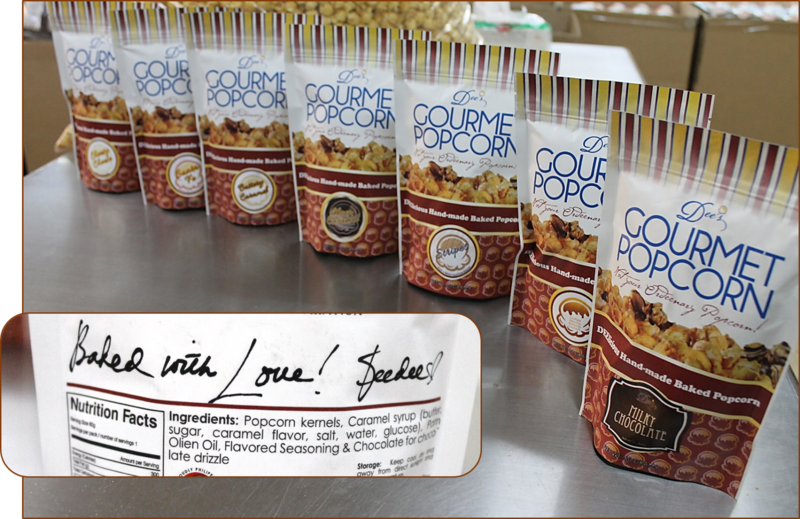 As years went by, the relationship between popcorn and the movies has changed more than the smell of a theater lobby or the at-home movie night, it’s changed the popcorn industry itself and a lot of products kept on coming. Our family is a self-confessed popcorn fanatics, we never leave the grocery without 4 packages of it - I'm talking about the microwavable ones. Well why not? I'm more trustful to popcorn than any potato chips in the market, when we talk of giving better snack options to our kids. 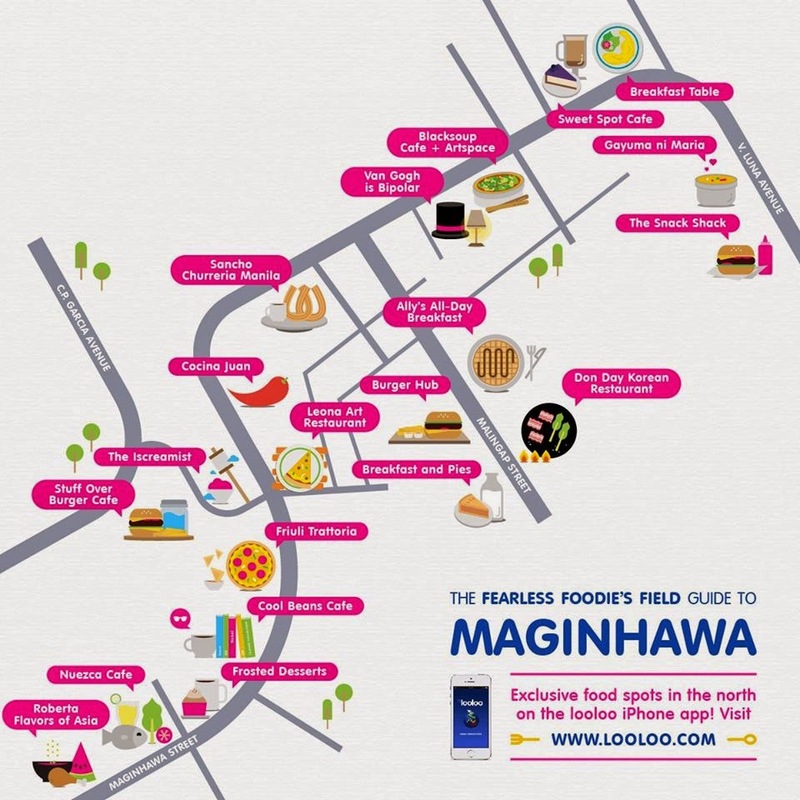 I've been meaning to do a food tour at Maginhawa St., Quezon City ever since I first heard of it. My first UP Teacher's Village food tour was with some church friends, back when my 10 year-old daughter was to celebrate her 7th birthday. Hubby and I decided to have lunch meeting with some of our party organizers at Gayuma ni Maria. Years went by, still yearning to do a trip back there, which may be more like a field trip, cause we live far south from Q.C. However, an invitation came for a food review at "the" Maginhawa St., finally and it was from Galli Village Cafe. Furthermore, my itchy feet made a way for the family to travel to Malingap St., one of the streets adjoining Maginhawa to check out Chef Edward Bugia's π Breakfast and Pie on its soft opening. That was it! Among the twenty or so number of cafe's and restaurant, and now foodies still counting, I have only been to three of them. 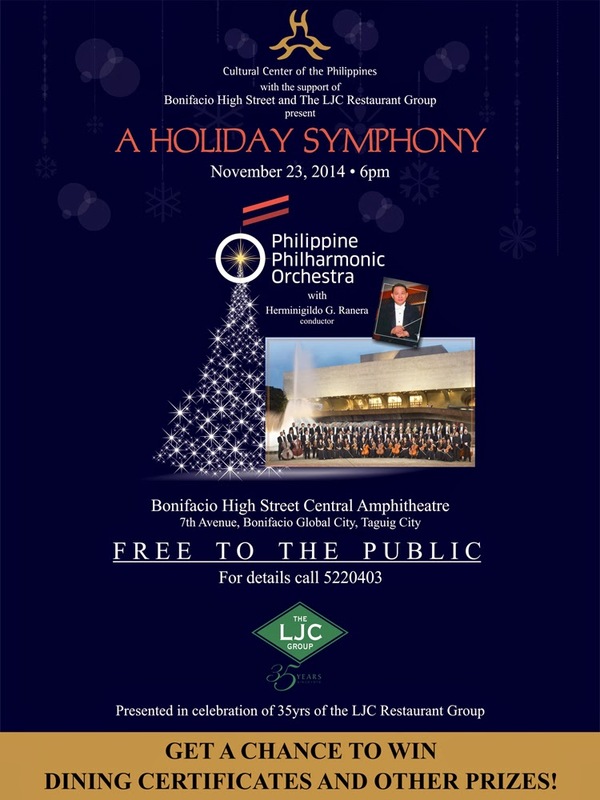 The Cultural Center of the Philippines , with the support of Bonifacio High Street and the LJC Restaurant Group present “A Holiday Symphony” featuring the Philippine Philharmonic Orchestra (PPO) on November 23, 2014, 6 p.m. at the Bonifacio High Street Amphitheatre, 7th Avenue, Bonifacio Global City, Taguig City. The concert, which is free to the public, will be a serenade of Christmas, classical and contemporary pieces. Under the baton of Herminigildo Ranera, the PPO will perform the Christmas-Beatle's Medley, J. Nowak's A Christmas Portrait, Ryan Cayabyab's Kumukutikutitap, selections from Starwars and The Titanic, among many others. The Philippine Philharmonic Orchestra is considered as the country's leading orchestra and as one of the top musical ensembles in the Asia-Pacific region. Holiday Symphony is presented as a Christmas offering of Bonifacio High Street and in celebration of 35 years of the LJC Restaurant Group, a company created by the late restaurateur, Larry J. Cruz. 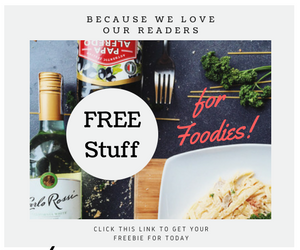 The LJC Group manages Cafe Adriatico, Abe, Cafe Havana, Bistro Remedios, Fely J's Kitchen, Lorenzo's Way, Larry's Cafe and Bar, Abe's Farm, Polka Dot Bakeshop and the LJC Catering Service. Guests watching the concert will also get a chance to win LJC dinner certificates, discount coupons and other prizes. For inquiries regarding the free concert, please call 5520403 or like us on facebook, LJCRestaurantGroup. For inquiries regarding subscriptions to PPO concerts, please call 8321125.
here, but it's the truth. However, this does not make any exception that I never cared of having good sets of teeth to replace milk teeth, same goes with how I decided to teach my kids how to take care of their permanent teeth. 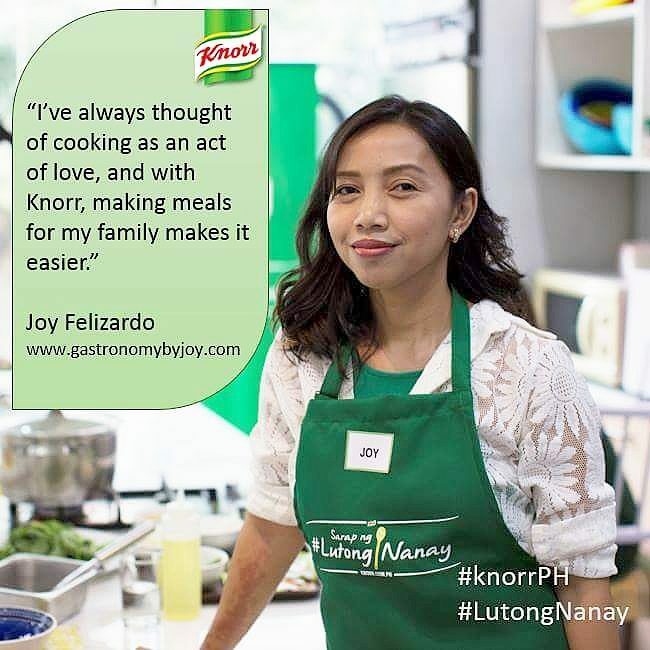 We are undoubtedly a family of sweet-tooth, that is one reason I learned how to bake and create lovely, appetite-inducing desserts. Thus, it is important that my family knows the importance of brushing our teeth to protect it from decays and what nots. But here's the thing, at the recently concluded Colgate event at Marriott Hotel Manila, the common knowledge that sweets are the major culprit of tooth decays had been debunked. Having realized that not only sweets -meaning foods rich in sugar and carbo and acids, can ruin our teeth. As a matter of fact, any kind of food can be culprits. Yes, even healthy food such as fruits and vegetables can also cause damage, this is due to sugar acids. Here is a reminder from Jamie Hall, "life is but a fleeting moment so do not waste a second on something that doesn't make you smile." Although I am up to my neck with business stuff and writing (blogging) assignments, plus add to that my parents coming home from Milan, certain invitations from friends are just hard to say no to. To say that the week has been “super busy” does not even justify, and with many things I have on my plate, I hope the title suits the weekend that made me forget about the word "busy." It has been a while since I last visited Pan Pacific Manila. To date I had organized two precious events for my clients here, one is a wedding and the other is an Alice in Wonderland-themed debut. Pan Pacific Manila is known to exude with comfort and classy flair without overbearingly so. Thus, many businessmen chose this as a venue for meetings and other business-related gatherings. It was a pleasure to grace an event held by Pan Pacific to launch their newest al fresco venue and with one of Manila's sought-after venue for sunset viewing. Last November 12, Pan Pacific Manila had a relaxing get together with valued guests and clients to the launch of Sunset Lounge. The guests were treated with overflowing drinks and a sumptuous buffet that samples the dishes that came from the Sunset Lounge Menu. 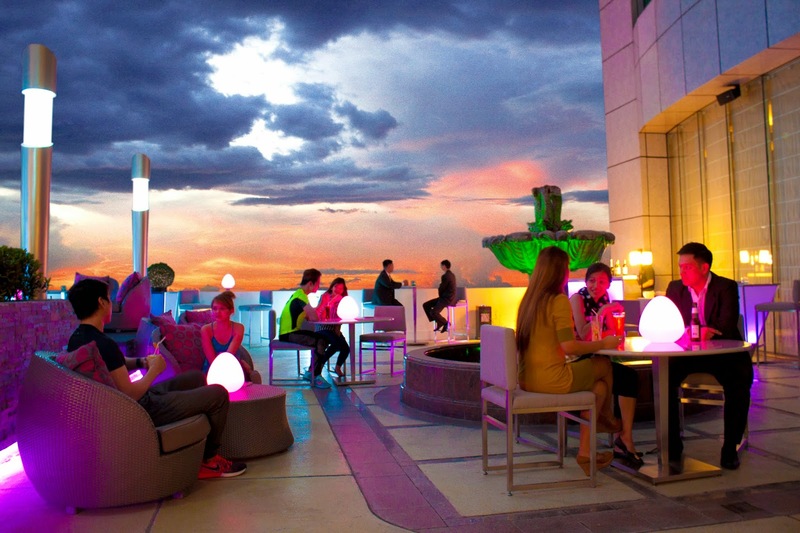 The guests got to unwind and enjoy the comforting ambiance while watching the famous Manila Bay Sunset. a venue partly concealed from everyone but is a jewel meant to be discovered. Located in Dao, Dauis in Panglao Island in Bohol. it is one of the well visited places by tourists. Nestled on a cliff with a view of the ocean, guests would surely enjoy the fresh air and the sea breeze and with a buffet that will make you want to stay for a healthy and organic get-away. Overcome your fears of these ferocious monsters, for they conquered this part of Clark, Angeles, Pampanga. 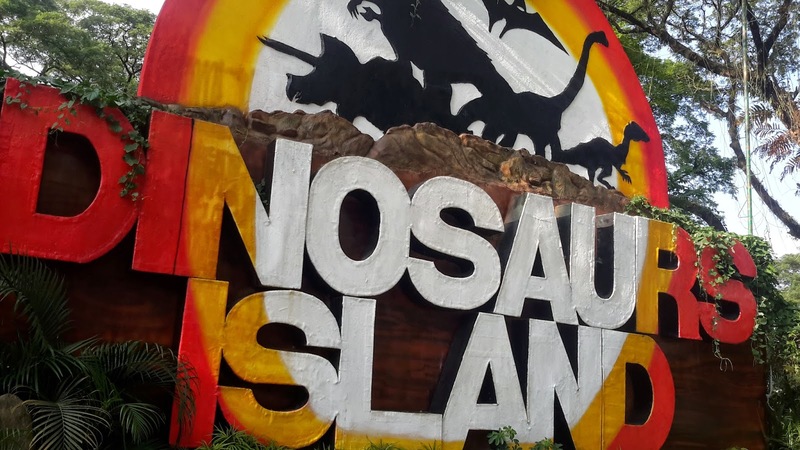 Hundreds of them, different kinds and sizes, are scattered and kept captive inside the walled park known as Dinosaur Island, only it's not really an island per se. In my girls' recent class field trip, I was the one who chaperoned them, I thought I wouldn't be able to enjoy it, since I'll be flying the next day to Cebu, but I made sure that I keep my girls safe, hydrated enough and having a blast with their friends and classmates. Though, I hated walking under the sweltering heat of the sun, I just made the most of it while keeping up with my Dana and Danica. The planned itinerary all summed up in Clark Free Port, Angeles City, Pampanga. 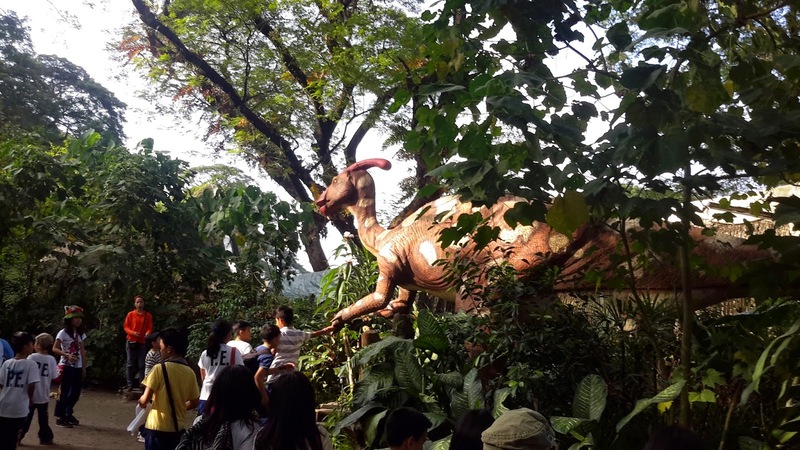 We first visited Nayong Pilipino, then the aircraft park, next is the Creamline Factory, and finally at Dino Island Park. 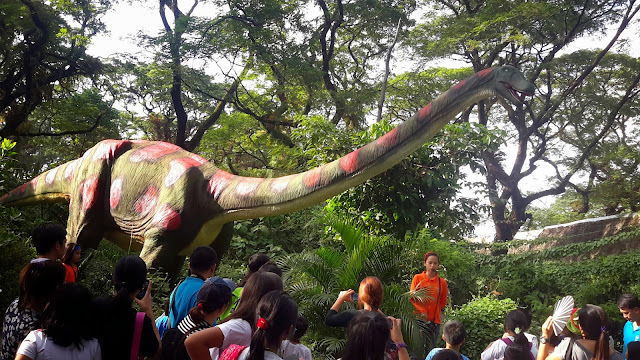 The tour and entrance fee is P 150.00, this includes activities such as the walk along the Dino Trail with a tour guide, entrance to the Fossils Museum, and an entertaining (yet scary) dance number from some dinosaur mascots. The following photos show how exciting the tour was, as if you were walking on a forest being migrated by semi-life-sized dinosaurs. First, pardon me for the not so clear photos, as I didn't manage to bring my heavy dslr, I guess not for this trip though, since I anticipated. Ticked out from my bucket list - swim with the Butanding! Well, I didn't really swam with the whale sharks, it took me quite a while to dive in the water and have a photo with the closest whale-shark at the pier of Tan-Awan, Oslob, Cebu. For one reason, I'm not a good swimmer, and also I need to take photos from above the water. But that doesn't mean I had less of an adventure and fun compared to my friends who were with me. The once-sleepy town was transformed into an eco-tourism spot and had been gaining popularity since they have welcomed the butandings in their coastal areas. "Tuki" as it is referred to by the locals, is such a gentle giant indeed. Our boat ride to Oslob was taken care of Bluewater Sumilon and even the adventure itself was arranged by the kind staff of the resort. With Bluewater Sumilon's own outrigger, we were brought to Tan-awan port with only 15 minutes ride. Coming towards the island, you can feel the exhilaration, with a swarm of tourists ready for the close encounter with our Philippine whale sharks. If you're ready for the holidays then let Century Park Hotel surprise you with early yuletide treats and a feast to share with the whole family. Would you care for some relaxation, rejoicing while spending a leisurely yuletide break this Christmas season? Century Park's Holiday Getaway room package thus is timely for this. 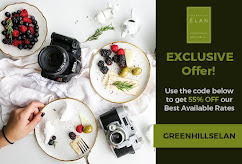 Enjoy the celebration in their Classic Superior Room at P4,500 net/room/night and Deluxe Room/Studio/One-Bedroom Park Tower Suite/Junior Superior Suite at P 5,500 net/room/night. 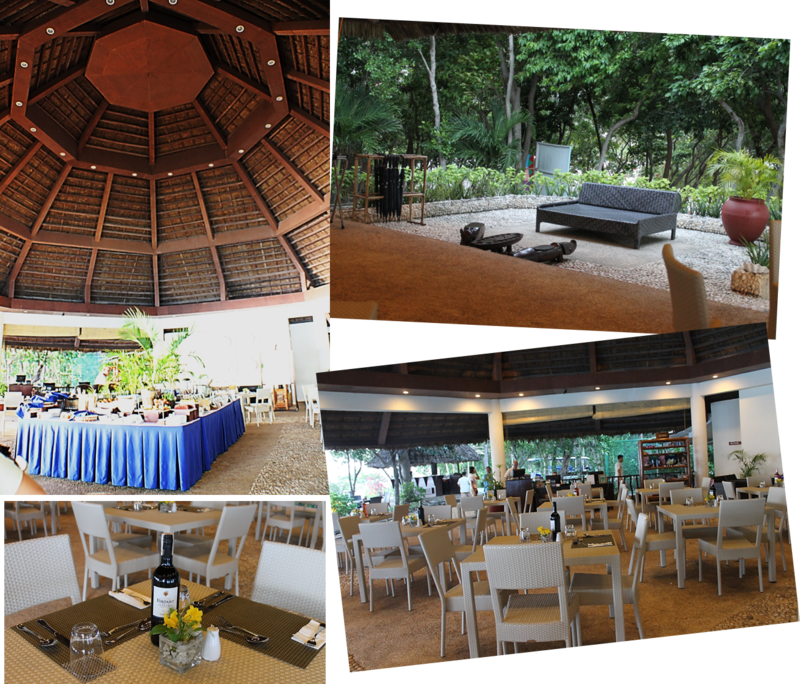 Packages include complimentary buffet breakfast for two plus P500 credit in all food and beverage outlets. 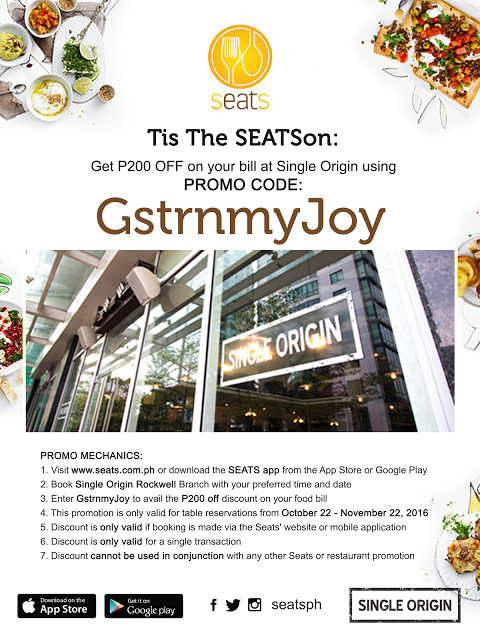 Promo is from November 24 to January 4, 2015. As you welcome Thanksgiving, why not indulge in a sumptuous buffet spread at the Café in the Park on November 27 with a vast array of appetizers, salads, sides, main entrees, succulent slow roasted U.S. Prime beef and satisfying desserts. Oh yes! Christmas starts this November at Century Park Hotel as they light up the 25-footer Christmas tree in a lighting ceremony on November 11 at the Atrium Lounge, where appetizing treats are hard to beat. Relish on the tapas buffet, wine, beer, cocktails by the carafe at the Atrium Lounge and get a chance to draw from their Day’s Lucky Pick for a minimum of P 1, 500+ on promotional tapas receipt. The Tapas Buffet is only P 595+ per person and the small plate tapas with local beer are only for P 320+. At P 375+, your small plate tapas can be enjoyed with an imported beer or house wine. Promo is available from 4:30pm to 8:30pm every Wednesdays to Sundays. Last quarter blast of surprise treats and feast bliss afoot at Century Park Hotel. You will enjoy authentic Japanese fare with Century Tsukiji’s Teppanyaki Meal Deals selection. Choose from Century Tskukiji Teppan Set at P1,455+ , Uminosachi Moriawase good for two persons at P2,005+, Moriawase Teppan at P1,500+ and Teppan Gozen at P575+. Available from 11:30am – 2:00pm and 5:30Pm – 10:00pm. Palm Grove joins the party by presenting overflowing treats to keep you cool this season. Get 3 drinks for the price of 2. Choose from Nestea Iced Tea (lemon and apple), Local Mineral and Distilled Water, Ice Cream and Halo-Halo. Promo is valid until November 30. Take an exciting plunge in our luscious sangria collection, all for P 385+ per order. Enjoy our Ice Melon Sangria, the well balanced cocktail that pairs red cherry and fresh melon. Toast and sip on their Classic Sangria, the perfect blend of fresh apple, lemon and pineapple. The mouth-watering Peach Tree Sangria is made from distinct flavours of fresh mango and pineapple. For more inquiries, contact them at telephone no. 528-8888 or email at information@centurypark.com.ph.